We’ve done the cooking for you. Slow-cooked USDA Choice Corned Beef Brisket ready for your microwave and a delicious dinner in just minutes. Our authentic recipe means all you will miss are the hours to cook it. Beef Brisket, Water, contains 2% or less Flavorings, Sugar, Salt, Sodium Lactate, Potassium Lactate, Sodium Phosphate, Sodium Erythorbate, Sodium Nitrute. I must agree with Patricia! The best ever!!! We are hooked on this corned beef and I didn’t buy extra before St. Patty’s Day either😞 Is there a way to have some shipped to us? Hello Sylvia, Thank you for your comment! Your question has been passed on to our Customer Service team who will respond to you directly. Absolutely the best Corned Beef ever. WOW! I have cooked too many corned beef dinners to count in my 77 years and have never enjoyed a corned beef more than this one. It was our first purchase of a Bill Bailey product but the Costco employee giving out samples convinced me to try one. My husband and I have enjoyed this one for two dinner meals and three lunches. I used the heating method of emersing in boiling water and was very pleased. My husband warmed his in the microwave but I enjoyed mine cold on marble rye bread. We can’t thank you enough for this great product. Be sure we will purchase them again and again plus pass the word on to family and friends. Thank you for letting us know about your experience! We are happy to have you as part of our Bill Bailey’s family. I am so happy with the Bill Bailey brisket that I got from Costco. .. I am so mad at myself for not buying a couple more before they stopped being available St. Patrick’s day. Is there anywhere I can get two delivered to me now? Hello Patricia, We are so glad you enjoyed our Corned Beef Brisket! Our inquiry has been provided to our Customer Service Manager and she will be contacting you directly. Cheers! Excellent for a crowd. Not only delicious but minimal cleanup. Never again will I do corned beef the old way. My Grandma used to make creamed corn beef and cabbage soup. I finally ventured out and figured out how she did it. 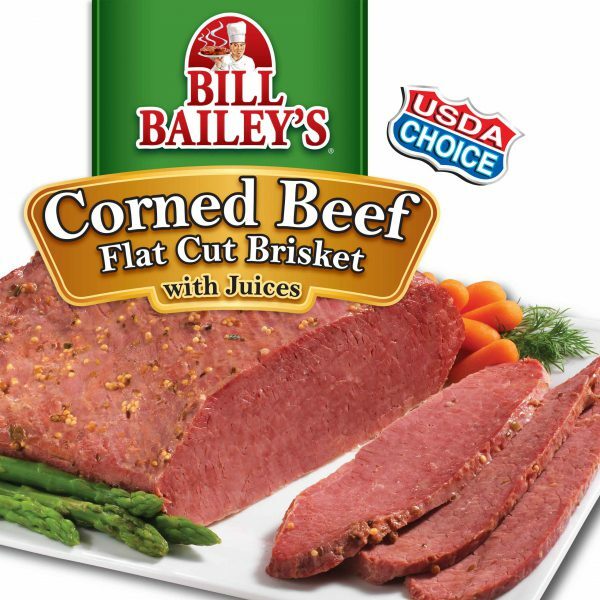 I’ve tried other brands corn beef but this is simply the best by far. I just wish it was available all year. We couldn’t agree more, Stevie! Corned Beef makes a great meal anytime. I bought this product a year and a half ago and it got lost in my freezer waiting for the right time. Finally had a perfect time to serve it! I also boiled up a small head of cabbage, 3 med/lg red potatoes unpeeled, 2 lg onions, and 2lbs of carrots, all cut in quarters. Heated up the brisket in the microwave according to the directions, and boiled the vegetables in a large pot on the stove for the same amount of time. The dinner was DELICIOUS, rivaling any corned beef brisket and cabbage dinner we have ever been served in any restaurants! It easily would serve 6 people, but thankfully there were only 4 of us and can’t wait to have Reuben sandwiches with the leftovers! A definite 5 star product! Can’t wait for March to come in hopes that Costco will carry this product again and will buy several to have throughout the year. It will never have to hide again in my freezer waiting for “the right time” to serve it …. Thanks for your product! My dad (Irish) taught my mom (Norwegian) how to make corned beef and cabbage after they married, and growing up it was always one of my favorites. This fully cooked corned beef brisket rivals my dad’s recipe, and is certainly much more convenient to make. I buy several from Costco each year when they appear around St. Patrick’s day. They freeze perfectly in their original packaging so that I can enjoy delicious corned beef all year round. Thanks for a great product!